She Sells Beer And Brings Cheer To Fans In D.C.'s Baseball Stands Beer vending at baseball games is a male-dominated industry. Christy Colt , a beer vendor at Nationals Park in Washington, D.C., shares what it takes to be successful at her job. 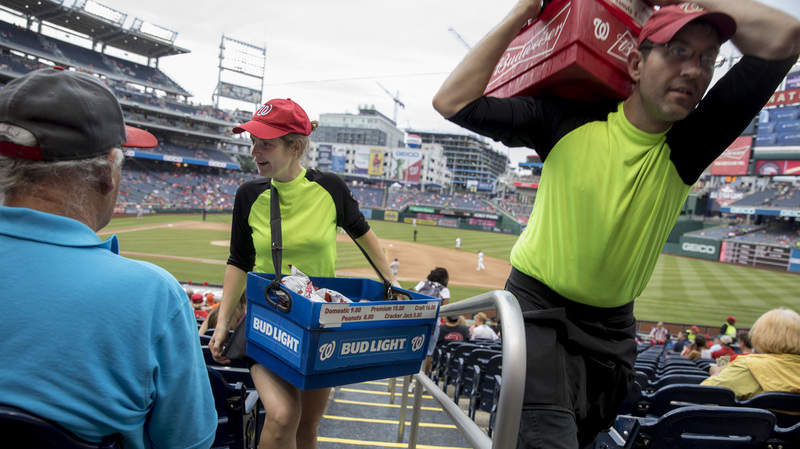 At a typical home game for the Washington Nationals, D.C.'s Major League Baseball team, about 60 vendors in neon yellow shirts walk up and down the aisles selling food and drink. The most popular concession by far is beer, and Christy Colt is great at selling it. "Bud, Bud Light, Stella, Shock Top, IPA!" That's her refrain, and she sticks to it. No shticks, no silly voices, no sleights of hand. The 35-year-old from Warsaw, Ind., is the only female vendor at Nationals Park who works every home game. There are a handful of other women who do the job, but they only work as fill-ins or for special events. She works the lower levels, which are reserved for the more senior vendors. Section 129 is her favorite: "Nicest fans in baseball," she says. She's average height, with dirty blond hair that she keeps tucked in a bun under a red Nationals cap. Her socks consistently don't match. She has a crooked smile that comes out whenever she sees someone she knows, which is often. "I'll sit and talk with somebody for five minutes and not worry that I'm missing sales," she says. "It makes it fun for me to come to work. I feel like I'm seeing my friends." Colt has slung beer at nearly every home game since the ballpark opened in 2008. When she's not vending, she teaches history to middle and high school students at a charter school in Washington, D.C. 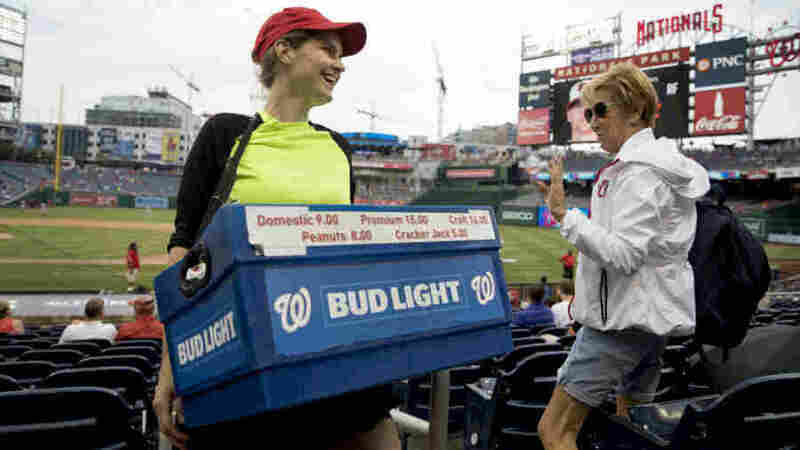 Female beer vendors are an uncommon sight at Major League Baseball games. In Japan, where baseball is also wildly popular, most beer sellers are young women. But here in the U.S., the "beer guy" is king. "It is definitely a very physical job," says Jeff Scheidhauer, the vice president of JET Services, which has a contract to manage vending for the Nationals, Capitals, and other Washington-area teams. Jet's online vendor application states that a successful applicant needs to be "physically capable to walk up and down aisles in a stadium while carrying a load (hot dogs, lemonade, beer etc) of up to 40 pounds." During a busy game, Colt said she can carry up to 60 pounds of beer and ice at a time. "I can't tell you how many times I've been told, 'Oh, it's too heavy for you, like, how do you carry it? You're a girl, doesn't it hurt your back or your shoulder?" Yes, it's hard, she says. But she can handle it. She runs half-marathons in the off-season to stay in shape. Nationals Park beer seller Christy Colt talks to customers as another beer seller passes in the stands during a recent Nationals game. She can carry up to 60 pounds of beer and ice at a time. According to Scheidhauer, the job has a high attrition rate for both sexes due to the demanding schedule and the physical challenges. New vendors start out selling non-alcoholic concessions on the stadium's higher tiers — the steeper steps make it a tougher place to work. Once their sales hit a certain threshold, they can advance to selling beer. Vendors routinely bring in between $150-$300 a game from commission, performance bonuses, and tips. Colt uses her earnings to go on international trips and buy tickets to Broadway musicals. She's seen her favorite show, Wicked, close to a dozen times. Colt came to Scheidhauer with prior experience — she got into the beer slinging game in college — and he calls what she does "an art form." It certainly can take artistry to navigate the stands on a humid summer day, particularly when fans start to get drunk. Colt said she's been on the receiving end of inappropriate comments from drunk fans, which she reported to her supervisor, who then confronted the fans on her behalf. While she felt supported by him and the rest of her team, she thinks other women might shy away from the job in order to avoid that kind of drunken fan behavior. But for the most part, the fans are the reason she loves the work. Before a recent game, a season ticket holder named Biff Henley came by to say hello. He gushed over Colt like a proud grandfather. "She is just absolutely wonderful — great teacher, great human being," he said. "We encourage people to buy from her." Colt cracked a crooked smile and waved goodbye to Henley. Then, she hoisted her bin over her shoulder and started down the steps. "Bud, Bud Light, Stella, Shock Top, IPA!"